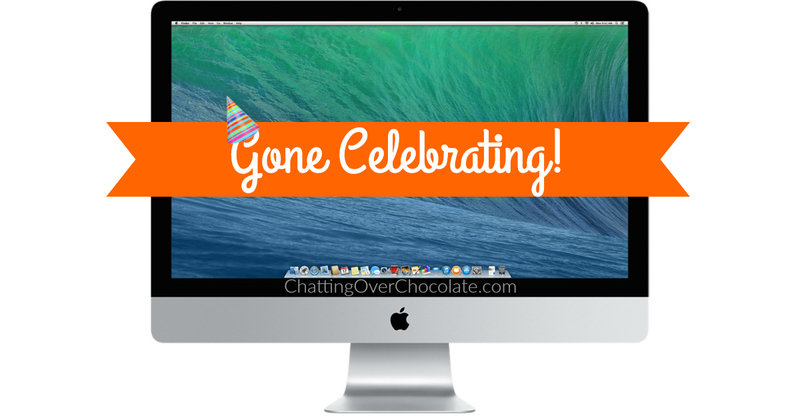 Chatting Over Chocolate: Gone Celebrating my Husband's Big 4-0! Gone Celebrating my Husband's Big 4-0! This is the final day of my husband's 30s! By the time you're reading this we'll be on the road to or already enjoying a little family getaway at the Iowa Great Lakes in celebration of this momentous occasion! Since this is such a big week for my love, don't mind me as I gush over his goodness a bit! After salvation, Jason is the greatest gift that God has ever given me, closely followed by the two beautiful daughters together He blessed us with! We fell in love at 19. It honestly seems like just a few years ago when I was organizing a big surprise for his 20th birthday! I got a group of our friends to arrive at my house at the crack of dawn, then welcomed him to a surprise 3 hour road trip to an amusement park! (On my 20th he took me to an amusement park about that distance in the other direction, so we were clearly meant to be a theme park couple! ;)) How is it possible that we went from celebrating "20" seemingly so recently, to now double that? I will say, forty doesn't bother me a bit (which is good because I'll hit it myself come September). It simply fills my heart with joy that I've had the past two decades of my life with this amazing man who gave me his name, his heart, and made me the mother of his children! Excuse me, tissue break time here! I'm not one who is ever at a loss for words, yet it's hard to fully express all that Jason means to me. He is selfless (daily he says to me, "Whatever makes you happy."). He is incredibly patient. He has shown me an unimaginable amount of grace over the years and our marriage is so much stronger because of it. He works so hard to support me and the family God has blessed us with, in every way imaginable! He is such a man of integrity and character, hardworking, humble, courageous, kind, strong yet gentle, compassionate, and never ceases to make me proud! He makes me laugh like no one else possibly could, and is always there to listen (even though my words come in abundance)! He honors me and counts the work I do as a wife, mother, and homemaker as important and valuable as his own career. (This does not go unnoticed or unappreciated for a moment!) He's my best friend for life, the one who shares all of my joys, sorrows, hopes, and prayers! What a beautiful gift marriage truly is! I praise God for it every day, and for another year we've enjoyed together. As many others before it, the past year has been filled with both trial and triumph, tears of sorrow and sheer joy, hardship and great hope, sickness and health. Through it all a few things have remained unshaken, the love we have for each other and the firm foundation we have in Christ. God is so good and I praise Him for blessing me with a sweet, handsome, and wonderful husband who truly is my better half! Thank you so much for visiting today, friends! Wishing you all a fantastic first weekend of June! Mine will be filled with sweet celebration! I can hardly wait! My husband just turned 40 a week ago! And mine is coming up in November. Ahh! Happy birthday to him! HAPPY Birthday Eve to Jason!!!!! Happy birthday to the hubs...40's are amazing! Sounds like he already had that covered though. Happy birthday to your husband! I hope you guys have a wonderful time celebrating! !